Ground beef and bison are both rich sources of protein, but these meats also contain a nutrient you may not be overly excited about -- fat. Although some dietary fat is necessary for your body to function well, too much of certain types of fat can be detrimental. Bison and ground beef have different levels of fat, so you may find one is much more appropriate for your dietary needs than the other. Due to the name of this nutrient, dietary fat is often associated with obesity. However, your body needs dietary fat for optimal function, and you could eat a high-fat diet and maintain your weight or lose some, as long as you control your calorie intake. Dietary fat is essential for life, as it provides energy, helps your body absorb vitamins, aids in brain development and helps keep your tissues healthy. Fears of fat intake leading to weight gain aren't entirely unfounded, as dietary fat does provide nine calories per gram -- more than twice the number of calories carbohydrates and protein provide. Foods provide different types of fat, and these can have different effects on your health. Total fat should make up around 25 to 35 percent of your daily calorie intake. However, you should eat as little trans fat as possible and less than 7 percent of your calories should come from saturated fat, as these types of fat can increase your risk of cardiovascular disease. The two other types of fat, polyunsaturated -- which can comprise up to 10 percent of your calories -- and monounsaturated -- which can comprise up to 20 percent of your calories -- are healthier and may help reduce your cardiovascular disease risk. Ground beef is high in fat, as each 3 oz. 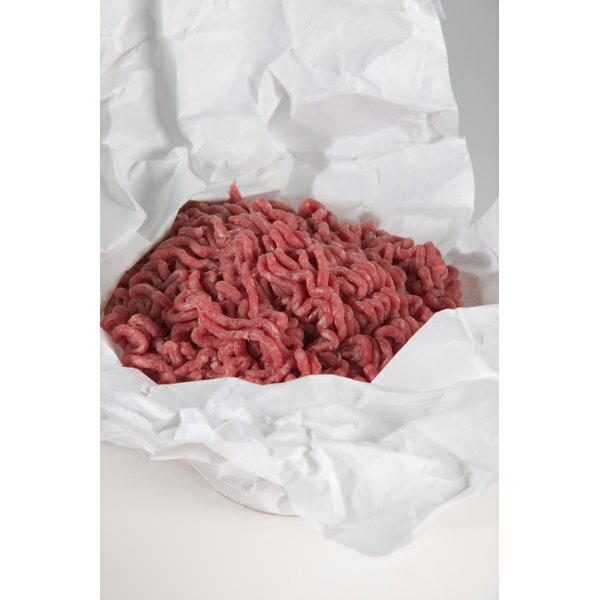 serving of 80 percent lean ground beef, cooked, contains 15 g of total fat. Of this fat, about 6 g comes from saturated fat, and 1 g comes from trans fat. If you consume 2,000 calories per day, your total fat intake should be between 55 and 77 g, your saturated fat intake should be 15.5 g or less, and you should consume as little trans fat as possible. While 3 oz. of ground beef doesn't provide a very high proportion of your total fat intake, it comprises 39 percent of the suggested limit for saturated fat and does contain trans fat, so it isn't ideal for health. Ground bison contains much less fat than ground beef, with just 7 g of total fat in a 3 oz. serving. Of this fat, only 3 g comes from saturated fat and none comes from trans fat. So, a 3 oz. serving of ground bison provides between 9 and 13 percent of your recommended total fat intake and 19 percent of your daily saturated fat intake, with no trans fat. These nutritional characteristics make ground bison a healthier choice than ground beef.